Silk is often considered a luxury fabric and not one we often associate with rugs. It is a beautiful, strong fibre that looks and feels fabulous. But, as with any popular or luxury item, the market is often flooded with inferior products. So join us as we discuss the difference between real silk rugs and fake silk rugs, and why the difference is so important! 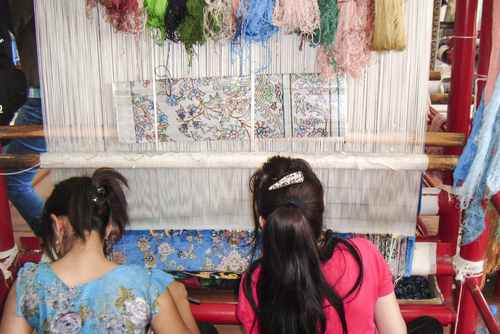 Silk rugs are created by hand weaving silk fibres – often no thicker than a strand of hair – into intricate patterns. The knot count for a silk rug can exceed 1,500 knots per square inch! They are thin and incredibly pliable, finely crafted and woven, and incredibly comfortable. Real silk rugs have a telltale sheen. This means the look and colour of the rug can change depending on where you’re standing in a room. It has a far thinner nap and pile than wool rugs and are often far more expensive. Which means they are expensive to replace if they get damaged. Real silk rugs are woven in the Middle East, China, India and Turkey. Because they are delicate, silk rugs are not recommended as floor rugs. Because they can be quickly damaged by foot traffic silk rugs are better as art pieces or wall textiles. Silk rugs are made by cultivating silk from silk worms fed on mulberry or a strictly controlled diet. 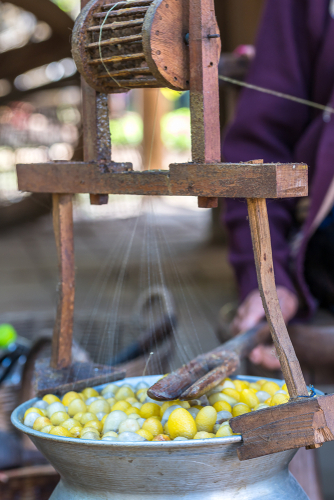 The silk worm cocoons are boiled and then unravelled into a single continuous filament that is incredibly strong and then used for weaving. What are Fake Silk Rugs? Fake silk rugs look like real silk to the inexperienced eye. However they don’t have the strength, vibrancy or feel of real silk. Like real silk, though, they don’t stand up to foot traffic or dirt. They are best used as wall pieces as foot traffic, washing and vacuuming can cause them to shed – a phenomena that can’t be stopped. Fake silk is made using rayon or viscose, which are two of the weakest fibres. They make rugs that are thicker, cruder, shaggier and obviously not real. Fake silk rugs have very flat looking colours and no sheen like real silk. This fake silk weakens, yellow, lose colour, ages faster and gets uglier faster. Fake silk likes to turn yellow or brown, especially if water is spilled on it. Rayon and viscose also likes to bleed, meaning a single wash can completely destroy your fake silk rug. As well as rayon and viscose, some fake rugs might use wild silk. Wild silk comes from silk worms with no controlled diet who are allowed to burst through their cocoons. This means that, rather a long filament, the fibre is broken up and then worked back together, making it weaker when it comes to weaving. Wild silk and excess cultivated silk waster are spun into lower quality rugs so they can be technically classes as real silk. But this is like taking lint from a dryer and spinning it into a new shirt. Fake silk uses material meant to be thrown away, not reused. It can be difficult to work out if you have a real silk rug or a fake one as they often come from countries that create real silk rugs. What are the Alternatives to Silk Rugs or Fake Silk Rugs? If you want the look of a silk rug without the cost, then it is better to get a mercerised cotton rug. Mercerised cotton is stronger and better than rayon, and it lasts longer. You get the general look of silk without the price tag. It also stands up to foot traffic better than silk or fake silk. However, if you want a rug that works with foot traffic, lasts long and cleans well, then it is better to leave silk products behind altogether and chose wool. Wool rugs are the best on all fronts: they clean best, stand up to age and use. Rugs made pre-1800 still look amazing today, especially when they are routinely cared for. Synthetic rugs can be a good choice, too, though they often feel hard and plastic to the touch. When wool is woven, it creates pockets that hold and hide dirt. Thus wool rugs still look good while being dirty. Synthetic rugs and even silk rugs can’t hide dirt. Silk and synthetic fibres can hide dirt in pockets so it sticks to the surface, so they look dirty faster. While synthetic has good surface cleaning options, their foundations are often jute based. This absorbent plant fibre will take and hold grime, hair, dirt and even pet urine long after it has been washed. Further, synthetic rugs and fake silk rugs are not sustainable resources. Because they are made from petroleum, they don’t break down. Silk is a natural resource, but it requires the silk worms to die in order to unravel their cocoons. Wool, on the other hand, is simply sheared safely from a sheep and grows back by the next year. Wool is the best fibre choice as it will break down long before synthetic and fake silk rugs will, causing landfill issues. How Do You Clean Silk Rugs? Cleaning silk rugs can be a challenge as they require delicate handling and cleaning with careful fibre testing and dye testing before washing. This is true of silk and fake silk rugs. Fake silk rugs, however, are weaker than silk fibres and need even more careful cleaning. Dyes often run on both real and fake silk rugs meaning they must be carefully tested before washing. They cannot be cleaned in the home as they need specialist tools and industrial wringers to ensure they are fully washed. If tests show that the fibre is too inferior to be cleaned in fake silk rugs, then it needs to be painstakingly hand cleaned with a small tool. All silk rugs, real or fake need several washes and often need careful acidic rinses to renew the brightness of their colours. Further, faux silk rug fibres commonly stiffen after cleaning, meaning they need to be carefully groomed, several times, with a handheld brush. As such, silk and fake silk rugs are more expensive and time consuming to clean – so they’ll cost you more in the long run than investing in a good wool rug. Why do Silk Rugs Bleed? Because of their thin strands, silk fibres can’t really be dyed before weaving. This means that the final patterns are actually dyed after weaving rather than during weaving like wool. 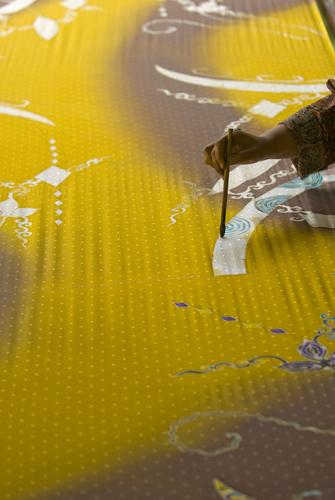 Designs on silk rugs are often stencilled in for gyers using bright pink and blue guide lines. When washed, these guidelines can bleed, suddenly revealing themselves and changing the colours of the entire rug. This happens especially in these case of rugs that aren’t washed before sale, meaning the dyes aren’t set properly or stabled. This is why we often tell people it might be cheaper to replace the rug rather than try to clean it. Real silk and wool are able to be cleaned but fake silk is better – and cheaper – to replace rather than attempt cleaning that will likely end in the destruction of the rug. Do you have a delicate rug that needs cleaning? Contact Woods Rug Laundry today to discuss your options!